Conduit recently reached 1000 commits, and with it came together some functionality that has been brewing for a while. You can now sync files, photos, music, and videos to your nokia n800 in an intelligent way (i.e. its not just a dumb file/folder sync). The ability to transcode said data to the most appropriate format for the device. FFmpeg/Mencoder is used to transcode audio/video, and gtk.Pixbuf is used to convert photos. 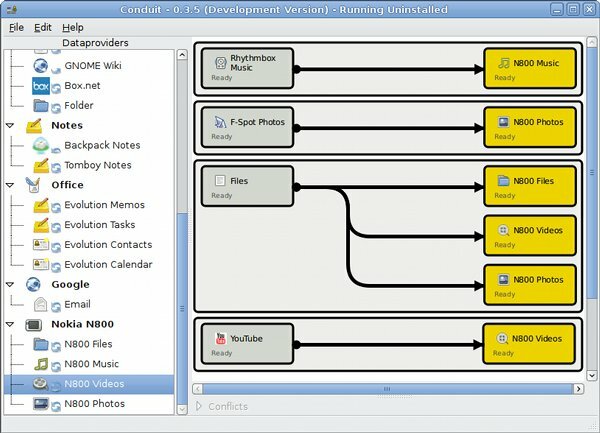 The converters use conduits built in dynamic modular plugin system, so if someone wants to write a audio video converter using GStreamer then please contact me. Also, those that are familiar with FFmpeg/Mencoder/Transcoding please feel free to contribute preset encoding profiles (video codec, size, etc). Presets are stored here (video), here (audio) and here (photo). Looser dependence on gtk. This means that conduit can be run from a console (-c command line switch) without gtk/goocanvas installed. This reduces the memory usage by about 10Mb! Massive refactoring effort to aid more code sharing between dataproviders and the complete decoupling of the GUI from the core application. This allows other guis to written very independently of the rest of the application . Stay tuned for a native hildon gui for nokian800 and/or ubuntu mobile. Improving rhythmboxes DBus interface to support adding/removing songs to the library and querying playlists (including smart playlists). Remember because we are gnomevfs aware some cool things are possible. For instance, one can sync + transcode videos/music to/from their phone which is mounted using gnomevfs-obex. Anyway, svn HEAD is pretty rocky at the moment, but please experiment. Once the database changeover has taken place things should stabilise for a 0.3.5 release. This will be a release candidate and then we will focus on bug fixing only. Ideally we will release a stable 0.4.0 release at or before gnome.conf.au. As an aside, I would be interested in talking to any of the RH online desktop folks at linux.conf.au as I am unable to make it to any of the northern hemisphere conferences on account of me being poor and in New Zealand. Excluding a dependence on gnomevfs (yuck). Hopefully gio/gvfs will make all my dreams come true.